NutriAsia Pacific Ltd was incorporated in the BVI on 21 November 2005. Its principal activity is that of an investment holding company. It is 100%-owned by the NutriAsia Group of Companies which is majority-owned by the Campos family of the Philippines. The NutriAsia Group is the market leader in the liquid condiments, specialty sauces and cooking oil market in the Philippines. Bluebell Group Holdings Ltd is also beneficially-owned by the Campos family. The Lee Pineapple Group has pineapple canning operations and oil palm planting in Malaysia. It is majority owned by Lee Foundation of Singapore, Lee Foundation of States of Malaya, and the Lee family. It has been a passive shareholder in DMPL since 2003. The Company has a stated policy of paying a minimum of 33% of prior year's net profit. For our corporate presentation, please click here. [fa icon="plus-square"] What is Del Monte Pacific Limited? Please see our Corporate Profile. [fa icon="plus-square"] How is Del Monte Pacific related to Fresh Del Monte Produce Inc and Del Monte Asia/Kikkoman Corp? Except for the joint venture companies with Fresh Del Monte Produce Inc, Del Monte Pacific and its subsidiaries are not affiliated with the other Del Monte companies in the world, including Fresh Del Monte Produce Inc, Del Monte Canada, Del Monte Asia Pte Ltd and these companies' affiliates. 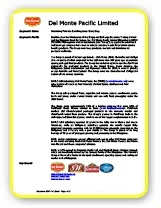 Please click here to learn more about other Del Monte companies. Del Monte Pacific owns the US Del Monte Foods, Inc.
[fa icon="plus-square"] Who are your major shareholders? Del Monte Pacific is 71%-owned by NutriAsia Pacific Ltd and Bluebell Group Holdings Ltd which are beneficially-owned by the Campos family of the Philippines. The NutriAsia Group is the market leader in the liquid condiments, specialty sauces and cooking oil market in the Philippines. [fa icon="plus-square"] What are your products? Packaged Food: packaged fruit, vegetable and tomato, ketchup, tomato paste, sauces (spaghetti, tomato, recipe and pizza sauce), meal mixes, pasta, broth and vinegar. For S&W brand - canned fruits, canned vegetables, beans and tomatoes. For more information on our products, please click here. [fa icon="plus-square"] Where are your key markets? USA, Philippines, rest of Asia Pacific, Europe, Middle East and the Indian subcontinent. [fa icon="plus-square"] How many employees do you have? [fa icon="plus-square"] Where is your pineapple plantation located? In Bukidnon, southern Philippines. One will have to take a domestic flight of about 1.5 hours from Manila to Cagayan de Oro, and then a land trip of about 2 hours from Cagayan de Oro to reach Bukidnon. [fa icon="plus-square"] How many board members do you have? We have 7 board members. [fa icon="plus-square"] Where are Del Monte Pacific's shares traded? The Company's shares are dual-listed on the Singapore Exchange Main Board and the Philippine Stock Exchange. [fa icon="plus-square"] What is Del Monte Pacific's ticker symbol? [fa icon="plus-square"] When was the Company's Initial Public Offering? The Company listed on the Singapore Exchange on 2 August 1999, and listed by Way of Introduction on the Philippine Stock Exchange on 10 June 2013. [fa icon="plus-square"] What was Del Monte Pacific's share price at the time of IPO? The Company listed its shares on the SGX at an IPO price of US$0.63 per share, or an equivalent then of S$1.07. Since 20 December 1999, the shares have been quoted in Singapore Dollars. [fa icon="plus-square"] Are the shares fungible/transferrable between the two exchanges? If yes, what is the process, the timing and costs involved? Yes, the shares are fungible between the two exchanges and the process roughly takes two weeks. For the steps and costs involved, please refer to pages 4 and 5 of this announcement. [fa icon="plus-square"] What is Del Monte Pacific's Financial Year? Del Monte Pacific's fiscal year runs from 1 May through 30 April. [fa icon="plus-square"] What is Del Monte Pacific's reporting currency in its financial statements? [fa icon="plus-square"] When does Del Monte Pacific report its earnings? Beginning 2003, the Company reports its earnings on a quarterly basis in accordance with the Singapore Exchange requirements. For an archive of our past quarterly results, please click here. For our corporate calendar, please click here. [fa icon="plus-square"] When do you hold your Annual General Meeting? In line with the Singapore Exchange regulations, all listed companies in Singapore have to hold their Annual General Meeting within four months after the end of their financial year. For our corporate calendar, please click here. [fa icon="plus-square"] What is the company's dividend policy and when do you pay out? The Company has a stated policy of paying a minimum of 33% of prior year's net profit. For more information on dividend, please click here. [fa icon="plus-square"] Who are the Company's auditors? [fa icon="plus-square"] How do I contact your Company Secretary? [fa icon="plus-square"] How do I contact your Investor Relations department? You may contact us at Tel: (65) 6324 6822, Fax: (65) 6221 9477 and look for Jennifer Luy or write to jluy@delmontepacific.com. [fa icon="plus-square"] How can I obtain a copy of your most recent annual report? jluy@delmontepacific.com. To download, please click here. [fa icon="plus-square"] Which analysts cover Del Monte Pacific?